Philadelphia native and global citizen, Xio Axelrod is an author of love stories, contemporary romance and what she likes to call “strange, twisted tales.” Bitten by the literary bug in 2003, she has self-published two volumes of poetry. Her short stories have also appeared in e-magazines such as Oysters and Chocolate. After a long hiatus from writing, Xio returned with the fiery web serial Starstruck, a story about finding the right person at the wrong time that became a viral hit. Xio also writes erotica under the pen name Xio Nin. 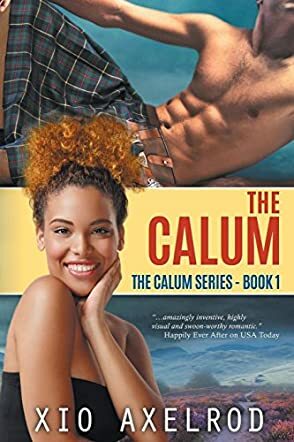 The Calum by Xio Axelrod is a unique addition to the realm we call "New Adult" fiction. Lovie is looking for love in all the wrong places. She also knows it's crazy to think that her Prince Charming could come in the form of a unicorn, or the calum. Yet it's to the Scottish Highlands she goes for Christmas and it's there that she meets the dashing Duff. Who said childish wishes can't come true? The calum is a reference to a "book boyfriend", one thing that I absolutely love doing! Who says you can't find your Edward, your Christian Grey, your Legolas? Okay, so maybe if your dream guy is a 1000-year-old elf, you have some problems, but it worked out for Lovie so, hey, it can work out for you too! I'm going to be honest, The Calum is not something that I expected. Xio Axelrod was a hoot and a half in terms of character and voice. I absolutely LOVED the dialogue and banter and simply thoughts inside characters' heads. I also wasn't expecting romance to be so much fun, and it really was. I found myself relating to both Lovie and Duff and I enjoyed their chemistry immensely. Additionally, I liked that the romance was interracial. I haven't been able to find that many books with interracial romance in them (other than some pretty weird erotica) so finding this was a breath of fresh air for someone currently involved in an interracial relationship. I will definitely be looking for more from Xio Axelrod!